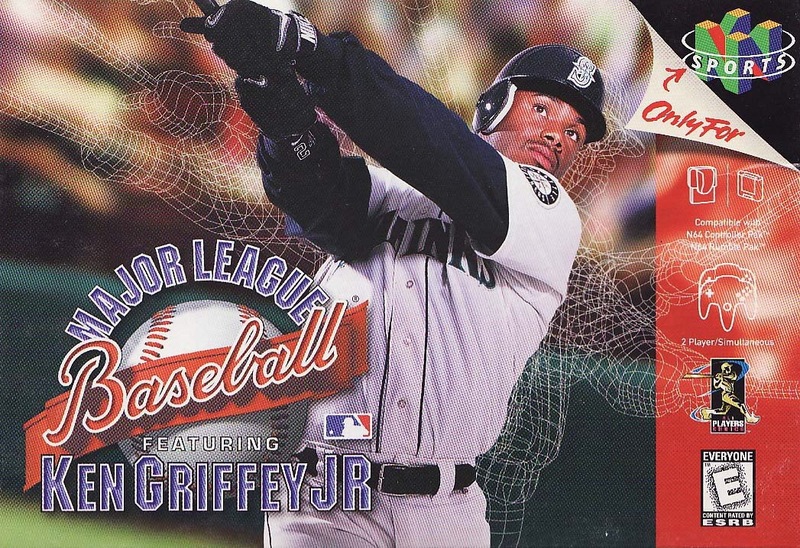 I’ve been playing a lot of Ken Griffey Jr. Baseball for Nintendo 64 lately. It’s a terrific break from paper writing. I started a full season about a week into November and immediately started trading players. I’m the Royals, but they’re hardly recognizable anymore. First, I traded for Griffey. I had to give up Johnny Damon and Jose Offerman, but the upgrade is completely worth it as Junior is easily the best player in the game. It’s very weird to see Damon in a Mariners uniform but Griffey’s never looked better. Then I shipped Mike Sweeney and Jeff King over to Chicago for some dude named Frank Thomas. Then I pulled Hideo Nomo and Trenidad Hubbard from the Dodgers. Nomo is great and a very fun reminder of how much fun he was to emulate when I was a kid. Hubbard’s bat is average, but he is off the charts on speed. Stealing bases/small ball is my jam (Go Royals), so Hubbs fits into my system perfectly. I don’t remember what I gave up for those guys though. Probably a starting pitcher. Or maybe it was Hal Morris. Finally, I flipped Dean Palmer and Sal Fasano for Omar Visquel who promptly fractured his ankle and is on the 1-2 month DL. Terrific. Desi Relaford is holding is own at SS though. For now. I also claimed a rookie named David Ortiz in free agency. He and Frank Thomas now swap 1B/DH duties. My next goals are to add Tony Gwynn in place of Dye or Paul Molitor to cover part of the weaker infield. I may need to wait for Visquel to get healthy and use him as a bargaining chip and let Desi stay at SS. I guess you could say it’s a Process. The real life Royals haven’t been nearly as active. They had a few key positions of need, and they haven’t made the moves we all expected them to make to address those needs. Specifically starting pitching, and a right fielder who could also serve as a designated hitter. I made a list of their top needs and fully expected them to have addressed them by now. I thought we were players for Yasmany Tomas, but he went to Arizona. I thought we’d look into signing Nick Markakis or Torii Hunter or Alex Rios or Melky Cabrera to cover our OF/DH need. Hunter retuned to his old Minnesota home. Markakis went to the Braves to fill the void left by Jason Heyward moving to St. Louis. KC is supposedly in the Melky discussion, but I’m not sure we’d want to lose the draft pick we’d have to surrender of we signed him. Rios is still available and apparently the Royals have checked in on him too. Thanks but no thanks. It’s beginning to look like we won’t be pursuing a big name outfielder for 2015. It seems the Royals are content to just sit back and let the market come to them rather than springing for the big names. At this point I’d look for the Royals to make another move like they made acquiring Nori Aoki last year (who is still unsigned and probably won’t be pursued until after the bigger names go, but the way things are going, I wonder if they’d take another 1 year flier on him?). Again, the worst case scenario here is that Cain plays RF and Dyson starts in CF. Two names out of Toronto could be ones to watch. Colby Rasmus has never been a spectacular and somehow got paid $7M by the Blue Jays to hit .225/.287/.448 in 2014. We wouldn’t pay him anywhere near that , and would probably platoon him with Dyson and keep swapping Cain back and forth between RF and LF. The other name from the Jays has Royals connections: John Mayberry Jr. is a beast with all the power but not much MLB success. He would be dirt cheap, and could provide depth in the outfield as well as at 1B behind Eric Hosmer. When I saw JMJ in Toronto back in September, I was shocked at how big the dude is, but he looked borderline lost at the plate. On a day when the Jays scored 14 runs off the fading Mariners, JMJ was the last Jays starter to get a hit – he went 1-4 with a double in the 8th, a walk and one ugly strikeout. Just a couple names to consider. Nothing revolutionary, but it’s beginning to look like that’s the kind of offseason we’ll be having with KC. Neither of these options addresses the DH hole in our lineup either. Which is why I’m afraid we’re going to have to take more drastic measures. The final possibility is that we ship Greg Holland or Wade Davis elsewhere in a trade. Holland is the preferable choice because he’s the most expensive of the two, and honestly, I think Davis is the better of the two. But a move like this is only possible because of how active Dayton Moore has been with the bullpen. The Royals have been very active in retaining the MLB’s best bullpen. First, they brought back Jason Frasor on a $1.8M deal with a club option for 2016. Then they signed everybody’s favorite #1 overall pick, Luke Hochevar, to a 2 year, $10M deal. I love bringing back Frasor, but I’m pretty curious to see how Hochevar does coming off Tommy John surgery last year. Luke’s career was very disappointing as a starter, but he turned it around in the pen in 2013. Feels like a lot of money to give a guy who has only had one good year in his career and is coming off a major injury. Assuming these two work out (and assuming we don’t ship Holland or Davis away) we seem to have fixed the “sixth inning issue” we faced in 2014. In fact, we’ve strengthened our bullpen to the point that we can just work backwards from the 9th inning to the 1st instead of the other way around. 5th – …we literally only need 4 or 5 innings out of our starters. It’s kind of a joke. And with how brilliant Brandon Finnegan was in September/October, he might just end up out there as well if our starters seem strong enough without him. He’d be a great 6th option out of the pen of needed. Let’s be honest, it’s only a matter of time before Ervin Santana comes back to KC. He was great here in 2013, and he tried to get more money elsewhere but couldn’t find the market he wanted. He found a home in ATL and had a fine season, but he’s back on the market and seems to be a perfect fit in KC. We can’t afford a Tier 1 starter, but giving a 4-year deal to a guy of Santana’s ability seems wise. Butler Olney of ESPN has reported that Santana wants 5 years, but that seems like a stretch. The only hiccup in the plan would be if another team (I’ve heard the Giants mentioned) were able to show more commitment with a longer deal. A rotation of Yordano Ventura, Danny Duffy, Jason Vargas, Jeremy Guthrie and Santana? AND Finnegan? Seems more than good enough. And with our bullpen as strong as ever? Good to go. Plus, he’s as likeable as they come. Just sign the guy. Another note: Jeremy Guthrie appears to be recruiting Santana himself (top-left). Atta boy, Jeremy. Go get him. And while you’re at it, can you convince him to bring Justin Upton along with him? Just kidding…but really. This isn’t going to happen, but I’d love to see it at least pop up as a possibility. The Cardinals decided not to tender utility infielder Daniel Descalso a contract this week. Many of you know that I come from a long line of Cardinals fans, and my dad raised me to root for them too. It’s a point of contention between other Royals fans and I because they hate the Cardinals with all of their being. I get that, and I won’t fight them on it either. Anyway, as a Cardinals supporter, Descalso has been my favorite player for STL over the past few years. He plays about 50-80 games a year. He’s a backup utility guy who can play all four infield positions, and even pitched an inning in 2014. He’d cost less than $1M to add as a better-than-Christian-Colon bench player, especially if we think Colon needs additional time in AAA. Probably most importantly: he hit .364/.472/.448 versus left-handed pitching in 2014. Sure, his career numbers aren’t phenomenal and the sample size was a bit smaller, but that’s 33 points higher than Danny Valencia hit this year at close to the same cost. Those LHP numbers are obviously way better than Mike Moustakas too. And with Infante’s age/injury status and the complete lack of depth behind Escobar (who played all 162 games last season), it might be a good idea to add a versatile and MLB-proven utility guy for the bench and occasional start. Biased? Maybe a little bit. I do own a Descalso jersey t-shirt. But I also think it’s a good fit a la Danny Valencia last year only with more positional flexibility. Just an idea. Take it or leave it, Dayton. Do I think the Kansas City Royals are the team to beat in the AL Central? I do. Get at me.